LSU vs Arkansas game in the late 1920s. In 1934, Alabama rolled to an undefeated regular season and garnered an invite to the Rose Bowl to face Stanford. It marked an apogee for Crimson Tide head coach Frank Thomas who had lead Alabama to a 33-4-1 record in four seasons. He had seen Alabama play in the Pasadena classic the year prior to his arrival in Tuscaloosa and now he was taking the Tide there himself. On the way to the game Louisiana's powerful Senator, Huey P. Long, allegedly made him an offer he couldn't refuse. LSU was coached by Biff Jones who had lead the Tigers to a 20-5-6 record over three years and had claimed the Southern Conference Championship his inaugural season. A confrontation between Long - who took a major interest in the team - and the coach outside the locker room at halftime of the final game of the season against Oregon had resulted in his resignation. Long promised he would make a big-time hire and he set his sights on Thomas. The Alabama coach had been given a five-year contract by UA president George Denny extension following the 1934 season that included "a nice increase" over his previous salary. The move came after Thomas name surfaced as a replacement for Tennessee's Robert Neyland who had been called away by the military for active service in Panama. The first candidate Long considered was Clark Shaughnessy who had lead Tulane for more than a decade but had just finished his first season at the University of Chicago. When that offer was rebuffed the Kingfish turned his attention to Alabama's Thomas who, as chance would have it was in New Orleans. When the Crimson Tide train stopped in the Crescent City on the way to California for the bowl game, a secret meeting was arranged between Thomas and Long, according to LSU's Athletic Director at the time, T.P. Heard. Long offered Thomas a $15,000 salary and salaries of $7,500 for two assistants of his choosing. Thomas accepted the offer on a handshake but demanded secrecy given the situation. "If any hit of this talk gets into the papers," he reportedly told Long. "The deal is off." Heard accompanied Thomas to Pasadena to keep Long appraised of the situation. Before the train arrived in Los Angeles, the Kingfish had changed his mind. Bernie Moore, an assistant at LSU since the late 20s, was given the job after a recommendation by Vanderbilt's Dan McGugin. 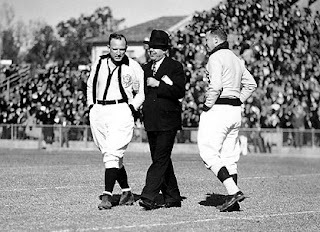 Alabama won the 1935 Rose Bowl and Thomas returned to Tuscaloosa where he coached for another nine seasons before retiring from the profession due to ill health. His final record at The Capstone was 115-24-7. Moore took the Tigers to two SEC Championships in his first two seasons then remained in Baton Rouge until 1947, finishing with a 83-39-6 record. Coach Bryant almost left 'Bama for Miami. The lists are endless of coaches leaving successful teams and teams not so successful. It's just what they do and what they have always done. Coaches and their families are nomads.